In August 2009, Honda quietly requested Takata Corp. create a “fail-safe” design change to its airbag inflators after ruptured inflators were linked to at least four injuries and a death. The automaker, however, did not notify the National Highway Traffic Safety Administration (NHTSA) about the change. U.S. law requires automakers inform regulators of potential safety issues and how they plan to prevent them. The design change, which was revealed in internal Takata (http://www.edwardslawok.com/takata-airbag-recall-lawyers.html) presentations and memos, shows that the companies were aware of the safety risks of the device as early as 2009. Massive recalls for the defective part did not begin until several years later, in 2014. This information could make the companies more vulnerable in the more than 100 pending lawsuits filed alleging the defective airbag inflator caused serious injuries and deaths. Both Honda and Takata have attempted to downplay the design change in an effort to deflect liability for the decision to make the change. Honda has claimed it did not notify regulators because the change was made in an effort to prevent future manufacturing errors, rather than an acknowledgement of a significant design flaw. Takata admitted to testing and deploying the redesigned airbag inflators at the request of a customer, but declined to provide a more detailed explanation. The design change added vents to the inflators to direct explosions away from a driver’s neck and upper body. Takata has been under intense scrutiny since 2014 when automakers began recalling millions of vehicles equipped with the faulty airbag inflator that has been shown to erupt violently, sending shards of metal into the cabin of a vehicle. A total of 90 injuries and eight deaths have been linked to the defective product in the U.S.
Honda is Takata’s largest customer. The automaker has recalled 8.5 million vehicles since 2008. A Miami court has consolidated federal lawsuits against Honda, Takata and other auto manufacturers and will tackle injury and death claims as well as lost vehicle value class action lawsuits. Trials could begin as early as 2017. 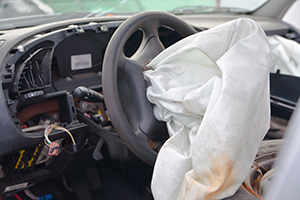 If you were injured or experienced property damage because of a faulty product like a Takata airbag, our skilled defective product attorneys will investigate your claim. Contact Edwards Law Firm immediately to schedule your free legal consultation.